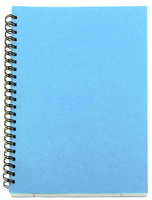 Spiral pad for stylish notes. Spiral binding for easy use. Features 80 leaves (160 sheets). Protective and stylish blue cover. Approx Dimensions (CM): D21.2 W16.5 H9. Approx Weight (KG):2.0951.